In all my travels when I choose to venture outside New Bern, one place I had yet to visit was Kinston. With the new year comes new places to see, so I headed west on U.S. Highway 70 just 35 miles down the road. The drive to Kinston is an easy one, and one that I am glad I did. Who would have thought a city with a population of only 21,000 people could be filled with such expansive history? Caswell #1 Fire Station Museum features a pumper from 1922. 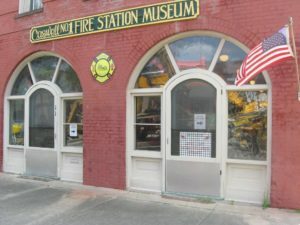 First up was the Caswell #1 Fire Station Museum. This historic place is named after North Carolina’s first governor, Richard Caswell. The fire station was built in 1895 after a disastrous fire destroyed much of the downtown area. A 1922 LaFrance Pumper is the focus of the museum, along with a collection of helmets, nozzles, ladders, fire extinguishers and more from over the last 100+ years. Next up was Harmony Hall, the last standing landmark home in Kinston. The house, built in 1772, served as a residence to prominent historical figures of Lenoir County. During the Revolutionary period, it was owned by Governor Caswell (there’s that name again). The house was also the site of a Civil War hospital and public library. Last restored in 1984, the house is a must-see if you are anywhere near Kinston. My last stop was the CSS Neuse II and Civil War Interpretive Center. The vessel is the world’s only full-size replica of a Confederate Ironclad. During the Civil War, it was sunk to avoid capture. It was recovered in the 1960s, and the found artifacts are on display at the center. If you are a Civil War buff, this place is definitely worth the time. There are many more historical places in Kinston to take a step back in time. All you have to do is take the time!